Last month, in celebration of the motorsport venue’s 113th birthday, Formula E’s Mitch Evans not only added his name to that extensive list of drivers, but also broke the record for the fastest time in an electric vehicle; 30.46 seconds in the new Panasonic Jaguar I-TYPE 2 Formula E car. The Panasonic Jaguar, however, wasn’t the only impressive vehicle making its debut at the Hill Climb’s celebratory weekend. 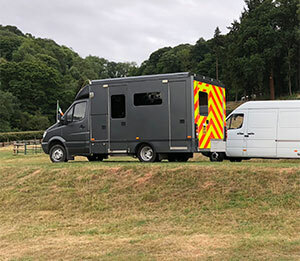 Capturing all of the action for big screens and livestream viewers was a decommissioned ambulance, newly and painstakingly fitted out as a professional, multipurpose OB vehicle by Nick Collier, managing director at High Viz Media Group. “Unlike the conventional curved shape of traditional vans, an ambulance is very square and chunky, with a really robust and durable body shell,” says Nick. “Essentially making it the perfect blank canvas to build an OB environment. An ATEM 1 M/E Advanced Panel sits at the heart of the vehicle’s production desk, where for the hill climb’s birthday celebrations, the team produced a multicam mix for the event sponsor GKN Driveline’s YouTube channel as well as for hospitality screens throughout the venue’s public and corporate areas. In order to provide coverage at every stage of the climb, and deliver this through the various platforms, the team laid more than 7km of fibre cable alongside the famous track, together with a multitude of fibre converters. Routing was handled through a Smart Videohub 40x40, which was complemented by a custom camera preview solution creatively engineered by Nick himself using a Raspberry Pi and a Smart Videohub CleanSwitch 12x12. A five channel Sony camera rig plus RF cameras for the pit and paddock were supplied by Broadcast Services in Chertsey, who Nick has worked alongside for the past five years. However, without access to a Sony matrix Nick and his team needed a solution that would allow their rack operator to recall the program screen quickly and easily whilst preparing the next camera to air. Nick says, “Not having the Sony control unit didn’t worry me as I’ve always said Blackmagic kit can do anything and everything you want it to, you just need to know how! “Alongside Blackmagic’s open SDK, and with a little help from my next door neighbour who runs an IT services company, we spent an afternoon writing a piece of code for the Raspberry Pi. This meant that as soon as the rack operator hits the paddle, the Smart Videohub CleanSwitch would immediately deliver the required camera feed to screen. As with many live events, the team had to produce an engaging and interesting live program of content, whilst managing an ever-changing schedule. “We didn’t know exactly what time Mitch’s hill climb would take place, but we still had to keep spectators entertained with big screen coverage,” Nick adds. The morning session, ‘Top 12 Run Off’, saw the fastest drivers from the British Hill Climb Championship looking to break records and set the best time of the day, but Mitch’s attempt had to be kept separate as the UK’s Motor Sports Associations’ rules do not allow electric cars. Mitch was to go in the ‘lunch break’, yet this still wasn’t a definitive time, and what if there was an accident in the morning? Lead editor, Ross Brown, used Premiere Pro to craft the various lengths of content. Videos included an introduction to hill climbing as well as how the Formula-E car was specially modified to be able to cope with the gradient.